Saturday Spotlight is a new feature where I'm showcasing some of the books I've reviewed for The Bookbag by posting reviews here for the first time. I'm generally trying to use it to promote books which people may have missed originally, but this is a release from this week which I'm really excited about and had to share with you! Rebecca and Hephzi are a pair of sixteen-year-old twins. But while Hephzi is beautiful, Rebecca suffers from a condition which has left her disfigured, taunted as a 'freak'. They long to escape their harsh upbringing and abusive parents, and think they may have found a way when they're allowed to start college. Then Hephzi dies, and Rebecca is left alone. Can she tell the truth about her sister's death, and break free from the horrors of her life? The main part of this intensely gripping novel is told by both sisters, starting with Rebecca after Hephzi's funeral, and then flipping between her viewpoint after Hephzi's death and Hephzi's narration of the months leading up to the tragedy. It's a narrative device which works well, breaking the story into short chapters and revealing just enough each time to leave you wanting to read on and find out more. 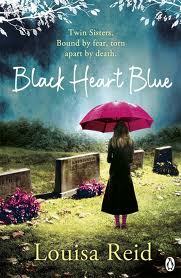 I wouldn't say I liked Black Heart Blue – given the subject matter, there's a strong argument to be made for it being the least enjoyable read I've had for quite some time. I was, however, absolutely riveted by it and found Reid's portrayal of both sisters to be stunning. Given that Hephzi is revealed to be dead at the start of the novel, and that her parents are clearly horrific, it's no mean feat to make her a rather unlikeable character herself, but Reid manages to do this by showing the way she can be unkind towards Rebecca, then redeems her somewhat as the novel progresses. Her father, on the other hand, the local reverend, gets no such redemption, and is one of the most loathsome people I've ever read about, while Rebecca herself may be one of the most sympathetic. It's bleak – not unrelentingly so, but close to it – and uncompromising and hard-hitting. It will almost certainly win a fair few awards, and while it's not something I'd reread, it's certainly something I won't easily forget. In dealing with abuse, disability, and the willingness of people to turn a blind eye to terrible events, it may be one of the most important books of the year. If there's a minor criticism, it's that there are parts which are rather predictable at times, but this didn't deter me from reading it in one sitting. Somewhere between a fairly strong and absolutely huge recommendation depending on the strength of your stomach, I'd say. Reid is clearly a major talent, and I'll look forward to her next book with interest – even if I do hope it's about a slightly lighter subject. Very interesting. I'll have to give this one a look. Thanks for posting about it! Great review Jim, I am really interested in this one and can't wait to read it to see how I feel!